Choose from our range of our retailer displays. These have proven to increase sales by creating an eye catching colourful display, the counter top or shelf boxes are ideal to gain customer interest frequently drawing an impulse buy, and the full floor stands ensure that the full range of colours and sizes are available to the customer and simple for stock counting and replenishing. 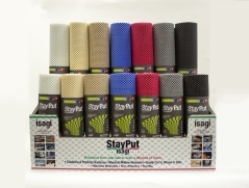 StayPut non-slip fabric is available in specially designed full colour ‘point of sale’ counter / shelf ready starter packs. The sturdy wooden box has colour photographs and bullet points providing customers with creative ideas for use. The eye catching starter packs form an ideal ‘point of sale’ for retailers, making a colourful, compact mobile display. Starter packs include: 42 rolls – which can be 42 x 12" rolls or 42 x 20" rolls, or a combination of both. Choose any 7 from 10 colours available: Pearl White, Almond, Taupe, Electric Blue, Indigo Blue, Chilli Red, Mimosa Yellow, Forest Green, Dove Grey, Black. 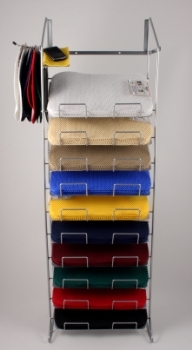 The chrome display stand is sturdy and hard wearing and designed to be a compact and effective merchandising ‘point of sale’ floor display unit for the StayPut range of fabrics. 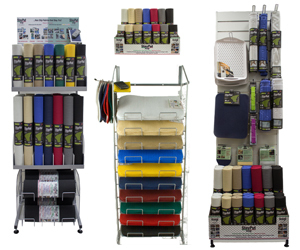 The display has been designed to accommodate the full colour range of the StayPut non-slip fabric rolls in both 12” and 20” rolls, the bottom rack sections carries two layers of Professional Heavy Duty rolls. When ordered the display is delivered with sufficient stock to fill the stand, along with two (2) extra rolls of each colour, in 12” and 20” rolls for replenishing sales. The stand display header has a colourful banner, with strong visual photographic images, that demonstrate the many uses of the product. The chrome display stand is sturdy and hard wearing and designed to be a compact and effective merchandising ‘point of sale’ display unit for the StayPut range of placemats. The display has ten shelves and hanging racks on both sides, to give flexibility to the retailer in displaying the sets and individual placemats. The stylish slat wall multi product retailer stand is an ideal 'point of sale' unit for retailers who want to maximise the StayPut product range in a clean and compact display. The stand offers the flexibility to accommodate a range of product size variations as the moveable hooks can be located in different positions. Easily assembled and with a small footprint, when ordered the display is delivered with sufficient stock to fill the stand. Anti Slip Fabric Rolls 12" x 6': 42 mixed colours - 6 x Pearl White, 6 x Almond, 6 x Taupe, 6 x Electric Blue, 6 x Mimosa Yellow, 6 x Dove Grey, 6 x Black. Anti Slip Fabric Rolls: 20" x 6':42mixed colours - 6 x Pearl White, 6 x Almond.